To understand why this quiet jest has become relevant this morning, one should read the Pitpass article, "A mutiny at Brackley... but here's a way to sort it". It seems that not all in the Honda F1 team are happy with the rumored management takeover because it means they will not get the fat redundancy cheques they are entitled to if the team is closed down. I do not know whether the story is true but this is not the first time I have read of it and it seems quite likely to me, especially as several journalists have expressed concern over the situation too. Assuming that there is at least some foundation of truth in the rumor, however, I find myself reflecting on work and our reactions to it. An ex-brother-in-law of mine spent much of his late twenties sailing a yacht filled with rich people around the Caribbean, visiting one tropical paradise after another. No doubt the work has its irritations but it must still be the most common dream of the perfect job. My own dream was somewhat different, however, and it was not until my fifties that I was able to give up security for the sake of writing. Before that, I had done a variety of jobs which has given me something to write about, at least. The pay may be lousy but I am doing what I was designed to do at last. I used to imagine that it must be the mechanic's and engineer's dream to work in F1 - to be a part of a team working at the famed cutting edge of technology and to be locked in battle with the great names of the sport must surely be the ambition of the best and most brilliant in the field. In a previous post, I even suggested that, so great is the appeal of competing in the sport, that the drivers would happily take a pay cut to enable them to continue to be a part of the game. Rumor has it that Jenson Button has done exactly that, accepting a reduction of 50% in his retainer for this year. Yet it seems that I was wrong and not all employees of an F1 team are ecstatically happy to do what they do. When it comes to either keeping their jobs or having a juicy lump sum to spend, some would take the money, according to rumor. My illusions are shattered and I am left pondering on the frailty of mankind and how easily we are deflected from the purpose of our existence. There are plenty of people who are losing their jobs through the recession without any substantial hand-out to sweeten the pill. They may not have liked the work they found themselves in but it was a meal ticket they may find difficult to replace. You cannot tell me that mechanics and engineers of F1 quality will find it equally hard to get another job, even though it may not be in the sport. The mere fact of being employed in such a demanding field means a very attractive resume, after all. So I have little sympathy for the pampered and well-paid employees at Brackley. They should remember that rarely do we find work being paid for doing what we love and, if keeping the job means taking a pay cut and saying goodbye to a golden handshake, it is no more than the usual price of happiness. If the rumor is true and Ross Brawn will be leading the team from now on, I think he would be fully justified to say to the workforce on Monday morning, "If you knows of a better 'ole, go to it!" You are absolutley spot on, Clive. I still have as a personal goal (first envisioned in 1960) to follow the F1 circuit for a full season as some sort of gofer or other such position with a team. I've not yet attained it, but have not given up on it either...only a lack of funding keeps me from it at the moment. That said, it would be difficult to find fault with someone who's primary responsibility to his family's well being puts him in a position where he must "go for the money." Yes, it's sad that they could give up a position that most of us would do for free, or at least minimum compensation, simply for more money. But a love of the sport is not necessarily a determining factor in employment...talent and skill is usually more important in today's highly professionalized world of motorsport. Maybe it's a generational thing. Or perhaps it's a result of today's society's focus on wealth as the prime measure of success. Either way, I can't help but look back fondly on the days when passion and dedication were the primary motivating factors that drew people into the sport. Not just an opportunity to make a living. One of my son Mad's best friends, usually known as Simbo, is a mechanic. He has never wanted to be anything else and is a very good mechanic, I think because of that. It seems to me that we love doing something because we are good at it and vice versa too. And I am prepared to bet that Simbo would give his eyeteeth to be a mechanic on an F1 team. He is good enough, for sure (and that is the only time I will use the F1 driver's favorite phrase, "for sure" - I swear it!). So I take it that team members are where they are because they are both good at their jobs and love doing whatever it is that they do. What I cannot understand is the willingness to leave such a job and do something else merely for the sake of a few thousand quid that will be soon spent. Being the best at their jobs, F1 personnel are paid well above the average and it is not as if a pay cut is going to put their families in danger of starving. But you're right - for some of us the bottom line is the one that counts, never mind job satisfaction and happiness. I find that a short-sighted and narrow approach but maybe that is why I am still poor. All I know is that, were I on the Honda team (somewhere in the aerodynamics field would suit me fine), I wouldn't think twice about staying on. I have been and still am passionate about mechanics and music among other things. At one time or another they both went from being a hobby to being a job. A lot of the magic goes out of a field when you become professional at it and it is your means of income. I imagine those at Honda F1 see the two possibilities as having a good check or having a job with no guarantee what-so-ever, that may disappear before the season ends. I agree that the idealistic dreams of our perfect job soon wither in the face of actually doing it - which was why I mentioned the irritations inevitable in sailing rich people from one Caribbean island to another. Writing is much harder work than people appreciate as well and it is only the luckiest who make a decent living from it. But such disillusion rarely deflects us from the task if it is truly what we were intended to do - dreams may die in the face of reality but love remains steadfast. Rarely do any of us enjoy the luxury of a guarantee; in fact, there are no guarantees in life - it is always a matter of taking risks to achieve an ambition. Clive: If you could convince all the Chrysler and GM workers of that, you'd make the president awful happy! I worked for many years on old and rusty British cars. How nice it would be to have nothing but brand new, clean, properly fitting pieces to deal with. An F1 mechanic is no better or worse than any other mechanic. If he does what he's supposed to, he goes unnoticed. Torquing bolts on a McLaren, Austin or F-18 comes down to the same thing. As you say, if you don't get fulfilment from doing a good job, you should be in some other field because you're never going to have a big fat bank account. The nice part is you can afford to buy a car in boxes and assemble it yourself! If what you say is true, Nick, those who argue against the viability of USF1 because of the lack of a pool of F1 experience in Charlotte are going to be proved completely wrong! I would guess that a background of mechanicking in NASCAR is easily transferable to F1 and that a fondness for tinkering with rusty old British cars is also a good qualification for the sport. Both are evidence of a driving passion for mechanical work and that is what is required more than anything else. He's also the one who works all night putting back the entire front suspension and nose that the driver knocked off in his little shunt in practice! I wonder how much of this is about money and how much about issues between the "rank and file" and the management. It's difficult to plan for the future when your bosses don't seem to know what they are doing, let alone whether what they are doing helps meet their objectives or anyone else's. Such has been the case at Honda more or less since Nick Fry took over and got worse when Honda arrived. While mistakes can be forgiven, long-term questionable behaviour over a number of years and across a large section of management can lead to major difficulties. It may well be that tensions built up through watching the managerial mess of the last few years are finally boiling over at the worst possible moment. In the last days at my previous employer (which shall remain nameless), I heard one branch of the employer had mutinied to the point where the entire staff there had broken their contracts. Initially the individual relating this (and attempting to prevent a mutiny at the branch where I worked) made it sound like they were mutinying over a pay deal (that made most people in the organisation richer but a seemingly random minority poorer). But as I listened, it was clear that there was a history of the staff at this particular branch not seeing eye to eye with the senior management based at HQ. It sounded like it had got to the point where the mutineers had got to the point where they suspected every act of the management was going to harm their ability to do their job and/or their job satisfaction, irrespective of the actual merit of those acts. That some of the actions by HQ were decried by even the most loyal members of staff at my branch (which was very loyal to HQ) also suggests that the mutineers may have had a point, at least to some extent. The response to HQ was to read the branch in question the riot act. I wasn't at the organisation long enough to hear the consequences of this, but given the lack of trust that was already there and given the ham-fisted way I've seen HQ administer such "riot act readings" in the past, I suspect matters will have deteriorated to the point of sackings. In fact, quite a few staff were laid off recently and it wouldn't surprise me if the mutineers or a significant proportion thereof were hidden among the "redundancy" numbers. Like in the example, I can see this ending very, very badly for all concerned, whether I have diagnosed the problem correctly or not. If ex-Honda are looking for redundancies, I think the mutineers may very well have selected themselves regardless of how good they actually are at their jobs. Which may have been more through poor communication rather than a true problem with the money they have - some people are amazingly willing to put up with a stressful work situation (particularly if it looks like it will improve) if they have sufficient "compensation" for it. The reason is not that they want the "compensation" but that they want a sign that the company notices there's a problem and cares enough to give some sort of token gesture indicating they will resolve the problem when possible. The new owners in turn will lose some good staff, not through fault of their own, but the fault of the previous regime(s). Without the mutiny, it would have been easier to focus on only removing those people least able to cope with the new regime and circumstances, but now they may have to remove some that only really struggled with the old regime in order to give staff morale a chance to recover. This is especially disasterous given that it is near the start of a season beginning with more consecutive fly-away races (four) than ever before. Still, if this is just about money, staying at the team should be a cause for celebration rather than mutiny. we are are at least within eyesight of each other's generation, if not actualy within the same generation clive, so i get where you are coming from and for my own part agree. but, every race weekend i've been noticing the faces that turn up in team shirts look younger and younger to me and that gives them a whole different perspective on their futures. i think the demograpics of who ever isn't thrilled not to get the cash out would be more enlightening. i'm assuming it's designers and engineers. i can actually envision in this era, at the age of 28 or 30 having team honda on my resume, a degree in something useful, not much to lose and whole host of personal quests tied in to that that might be in need of some green- or whatever colour the lb or euro comes in-to go tilting my abundantly talented lance at. i can also imagine that for certain areas of expertise there are other opportunities (hopefully) coming on line that might appeal as much if not more. as much as i love f1 i think i'd rather be part of a team that cracks the problems of energy storage than say gaining an extra 2/10 sec out of an engine. it's more of a challenge for one thing. but, then i can't do either so i'm a bit jealous either way. the future may be wide open for a lot of these guys and girls even if the current environment is tightening up. i can empathise with anyone who can actually see more than one path and not feeling mired in the sentiment of the priviledge of working in f1 enough to be grateful that another possibility (ie: what amounts to a severance cheque ) isn't going to open up. i don't mean to sound contentious but i am assuming these people actually have abilities and talent that transcends several industries so, while it's good to work in one that is also your passion, i imagine that your general field is also your passion so moving on is just another step ahead, not down. it's not like f1 is doing them a favour by hiring them. on the other hand, of course-because life has more hands than a hindu god- since there are honda team members who are happy to keep the job and maybe don't have better or other options, then i say bring on WHOEVER can keep the team afloat - even if i may not personally like them. completely off topic! love the cartoon. 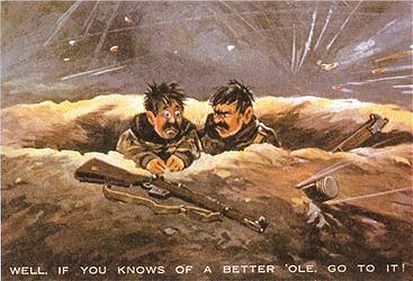 i wish someone would gather up a collection of old ww1 cartoons from all the major players and publish them. it astounds me how every time i delve into the here and now, that war crops up. it really was the agent provoacateur of the next 100+ years of the world. Alianora: Interesting idea, although I doubt even Nick Fry could be so bad a manager that he has managed to antagonise the workforce to the extent obvious in your example. Usually such problems are caused by the remoteness of decision making from the actual scene of operations; in Honda F1's case, the operation is so small that managers must be aware of the immediate effects of any decisions made. Bad management may well have been a factor in some employees preferring to leave but I think there are other matters involved too. Vera: Good point - attitudes towards employment have changed a lot since I was young and the "career" has become more important than the actual job. In some industries it is actually expected that the workforce remain in constant flux and those who linger too long are regarded with suspicion, as though their motives are suspect in some way. I may have been a little hard on those raised in such a culture, therefore, but still maintain that it is not appropriate in an atmosphere like an F1 team, where teamwork is everything and devotion to a common goal paramount. Perhaps I understand the motives of the would-be departers now but I would still not hesitate, were I Ross Brawn, to let them go and take on others who really want to be a part of the team. Punch does not seem to be as well known in America as it is in Britain, perhaps because the New Yorker fulfilled a similar role on this side of the Atlantic. But it is both the inventor of the cartoon and the owner of a vast archive of cartoons spanning over 150 years. An idea of the treasures available can be gained by having a look at their site, although rights to the cartoons have to be paid for. I did not find it myself but I presume there is some way of searching through the cartoons of 1914-18 for good examples.